Cleanliness is Happiness Cleanliness, hygiene, and sanitation are the most important aspects in the restaurant business. Regardless of how tasty your food maybe, you dishes creative, and your service excellent, consumers will not want to flock to your establishment if it is not clean. Some cities such as New York have even implemented a sanitary letter grade inspection where restaurants are rated with letter grades. The local department of health automatically closes anything below a C down. In order to maintain a clean and healthy working environment for not only the staff but also the patrons there are several cleaning and janitorial supplies that are essential. Vendors such as Elite Restaurant Equipment have everything that any business needs to help maintain a high level of cleanliness and sanitation. When it Rains Be Prepared Having several attorney friends I can tell you without reservations that one of the biggest lawsuits that restaurants get are slip and falls. These types of accidents can be avoided with just a few pieces of equipment. A restaurant can limit its liability immensely if they take several steps to avoid such falls. Every restaurant should have a welcome mat.It has been proven that welcome mats make the customer feel more at home the second they walk into an establishment. The reason for this is they associate the welcome mat with a household welcome mat that they encounter everyday. Consumers are more likely to feel comfortable thus staying longer and ordering more food and beverages. Welcome mats can also provide a good area for customers to wipe their wet feet before entering an establishment. Thunder Group is at the forefront of welcome mats. These mats are available individually or in a pack of 12. Although this is a good method of alleviating this problem it is quite possible that some customers may not do this thus making your floor inside slightly wet. A caution sign is a great way to warn your patrons of a wet floor from rain or cleaning, and at the same time limit your liability if someone should fall. Winco and Thunder Group both sell a variety of caution signs. 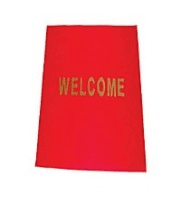 These signs are available in cone shape or the standard shape. They yellow signs can even be seen and recognized in the darkest of environments. Employee Sanitation Besides having a clean environment for your customers having a clean environment for your workers is another essential component for any successful restaurant. One way to ensure employee sanitation is two have many sinks located in your kitchen. This is essential not only for your wait staff but also for your cooks. Make sure to have a separate sink to wash food. Using a sink that has been used to wash food or vegetables may actually contaminate somebody’s hands. Dishwashing is an essential piece of keeping any restaurant sanitary.Most restaurants have large dishwashers that clean dishes automatically. Sometimes not all the dishes can fit into the washer and their maybe a high demand for items such as glasses. Hand-washing dishes can help alleviate this problem and avoid backup in the kitchen. In order to insure hand-washing dishes is sanitary a good pair of rubber gloves in a necessity. Thunder Group makes two different types of rubber gloves. These gloves come in a variety of colors and are available in both latex and rubber material types. Restroom Maintenance There is a saying in the restaurant industry, most of the time you can determine the cleanliness of the kitchen by looking at the cleanliness of the restroom. There have even been times I myself have walked out of establishment because of the poor upkeep and maintenance of the restroom. Restroom up keep can be one of the biggest challenges in cleanliness however with the right types of cleaning supplies this can be achieved rather easily. Some of the supplies necessary to keep a sanitary restroom include mops, soap dispensers, toilet seat covers, toilet paper, paper towels, hand dryers, and waste containers. At the end of each day moping the restroom floor is essential for all restaurants. Moping can help rebel against odor and also keep the overall appearance neat. 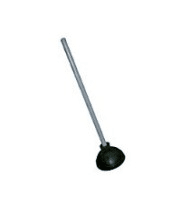 Winco has a variety of mop heads with or without cut ends. These mop heads can either be 24 or 32 oz. sizes. 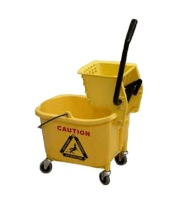 Thunder Group and Winco also have 30 quart mop buckets with wringers. Replacement wringers are also available for each brand and they should be changed periodically to help maintain sanitary conditions. Toilet paper is obviously a must for any restroom. One of the most popular brands for commercial grade toilet paper is Nittany. 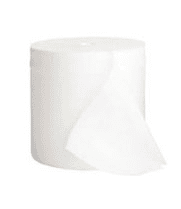 Nittany offers durable 2 ply toilet paper and comes with a standard 1000 ft. per roll. This toilet paper can be purchased individually or packs of 6,12,24,48 and 96. If one wants to save money I suggest here buying in bulk. Nittany is also the premiere distributor of commercial grade paper towels. Paper towels are another essential cleaning supply in restroom upkeep. White paper towels come standard with 85 sheets. These come individually or in packs of 6,12,24,48 and 96. They are also available in brown with 350 sheets per roll in a pack of 12. Although paper towels are an essential part of any restroom the environmentally friendly way to dry has become a hand dryer. American Dryer has become one of the most trusted brands in the industry. Hand dryers are available in automatic models or manual ones. Some of the nozzles of these hand dryers can rotate 360 degrees. The covers on some of these hand dryers are also available in stainless steel for added durability. American Dryer’s top model Extreme Air offers an insane 4/8 horsepower and 540 watts for quick and easy drying. Some establishments find it not only environmentally friendly to use a hand dryer but also cost effective as it alleviates a need for paper towels. Although this maybe to some a good strategy some customers will not use a dryer and I recommend obtaining both with a sign that you can help the environment when using a hand dryer. This should be posted in a place that can be seen easily. 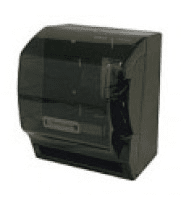 Dispensers are another essential tool in maintain a clean restroom. There are at least two different types of dispensers that are a must for every restroom. The third dispense is a paper towel dispenser. Winco and Thunder Group both offer paper towel dispensers. You may not purchase these if you decide to only go with hand dryers. The two essential dispenser that are necessary for all restaurants are a soap dispenser and a toilet paper dispenser. Thunder Group makes some of the best soap dispensers on the market. 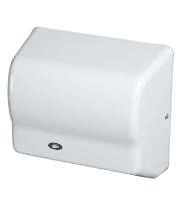 Jumbo toilet paper dispensers are available from both Winco and Thunder Group. The next essential pieces of sanitary equipment that one needs are toilet seat covers. Toilet seat covers come in a pack of 250. Winco sells these individually whereas Thunder Group sells them in a pack of 12. Once these are purchased a dispenser is a must. Winco and Thunder Group both offer toilet seat cover dispensers. For added luxury and class Thunder Group has a dispenser available with chrome. Finally the last essential piece of equipment one needs to maintain a sanitary restroom is waste containers. 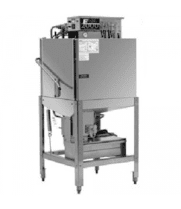 Three major brands of waste containers are Winco, Cambro and Thunder Group. Before determining which brand to use the biggest factor to consider is how large of a capacity you need the container to be. Cambro offers small sized container of either 8 or 11 gallons. Thunder Group and Winco offer containers in 23, 32 and 44 gallon sized capacities. Make sure here to estimate how much waste you will produce per day. The Importance of Everyday Cleaning Everyday upkeep of your restaurant is essential in order for it to be successful. One way to ensure this is to mop the floor every night. 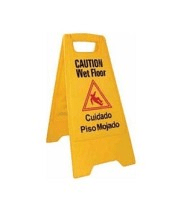 After moping the floor make sure to display several caution signs to avoid messy injuries or lawsuits. Sweeping with a broom is also a great method to ensure everyday cleanliness. Thunder Group offers several different types of brooms. 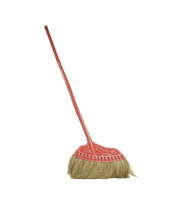 Brooms can be purchased in one standard or four colored bristles. 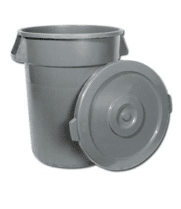 In addition Thunder Group and Winco offer a variety of different sized dustpans. It is important to estimate how much dirt you will produce in order to find the proper sized dustpan. By cleaning everyday you can avoid bugs, mice, and other pests that might arise in a dirty environment. Cleaning everyday will also distinguish your restaurant from competition by providing your business with a better reputation. It’s Spotless! A clean restaurant will distinguish your business amongst others. With the proper cleaning supplies keeping a sanitary restaurant can be easy. It is extremely important to keep the restroom clean. How clean a restroom is can be associated with how clean your restaurant is overall including the kitchen. Everyday cleaning is an essential piece also of maintain a clean environment. It is essential to mop the floor in the restaurant as well as in the restroom everyday. If the following advice is taken seriously you are undoubtedly going to have a clean restaurant resulting in an increase in profits.